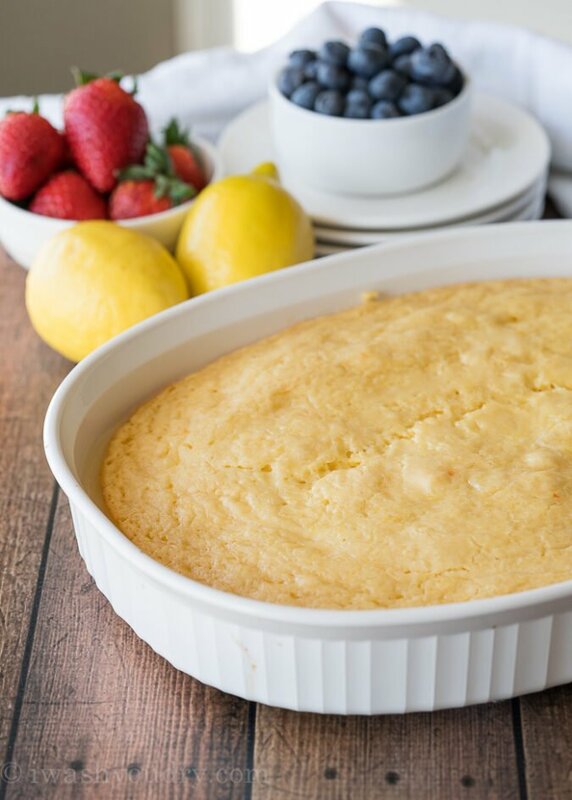 This Lemon Pudding Cake is a self-saucing summery cake that’s just 5 simple ingredients and super easy to make! With Spring in full bloom I’m craving all things lemon and berry. My allergies are also giving me a run for my money, but I’m determined to not let them take me down for too long. This cake is so easy it practically makes itself! 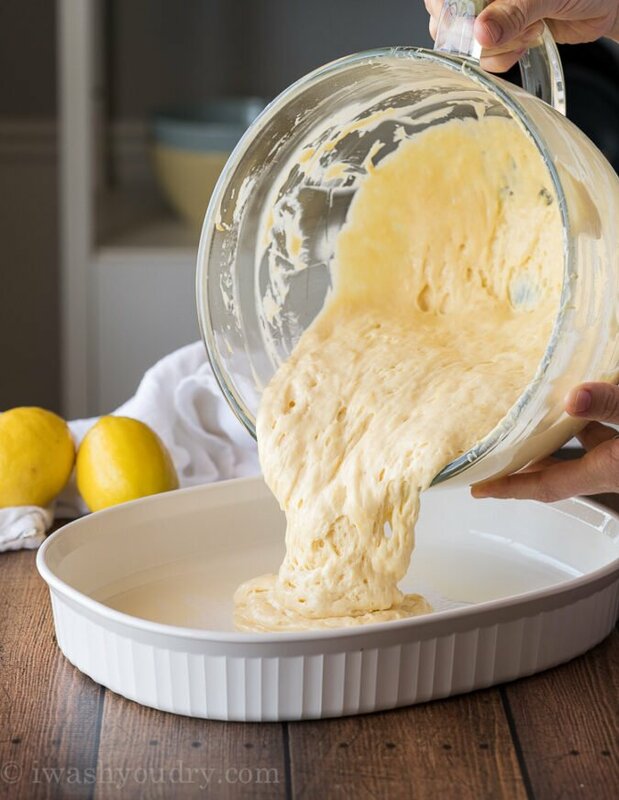 Just combine a cake mix with some milk, sour cream, lemon juice and a little bit of lemon zest. 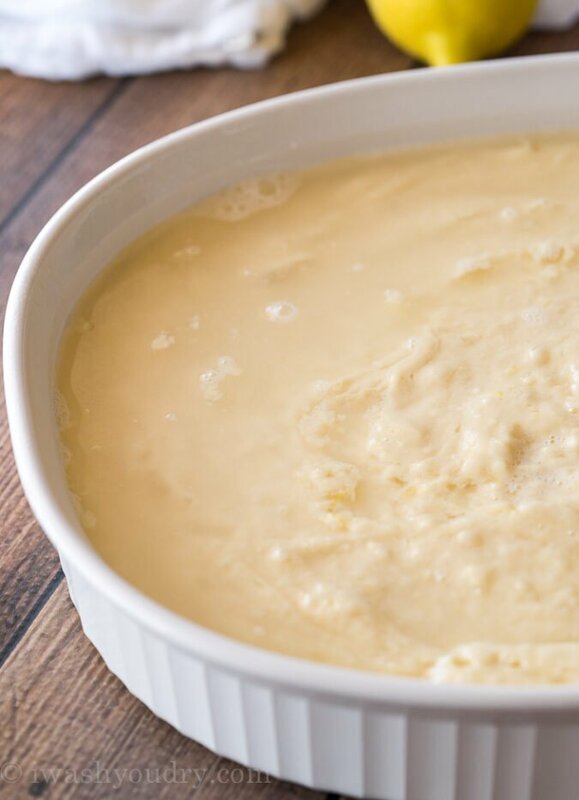 Pour the cake batter into a baking dish and pour boiling water over the top. DO NOT STIR the boiling water and cake mix together! Let the cake bake and watch the magic happen! I love this quick and easy cake so much because it’s perfect for an easy summer-inspired dessert. The lemon really pops in this cake. 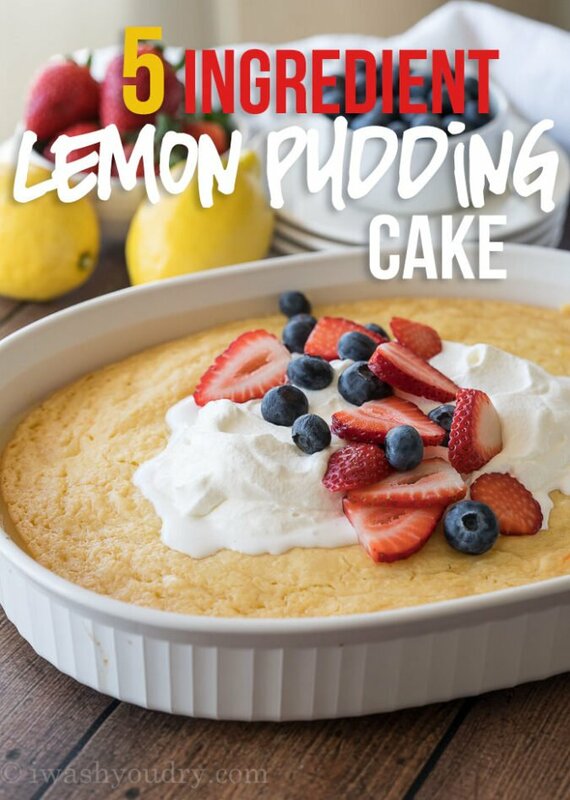 If you’re feeling extra lemony, try using a lemon cake mix instead of a vanilla flavored cake mix. The trick to this self-saucing pudding cake is to pour boiling water over the top of the cake mix. Once baked, the cake mix will rise and the boiling water creates a soft lemon pudding sauce underneath. 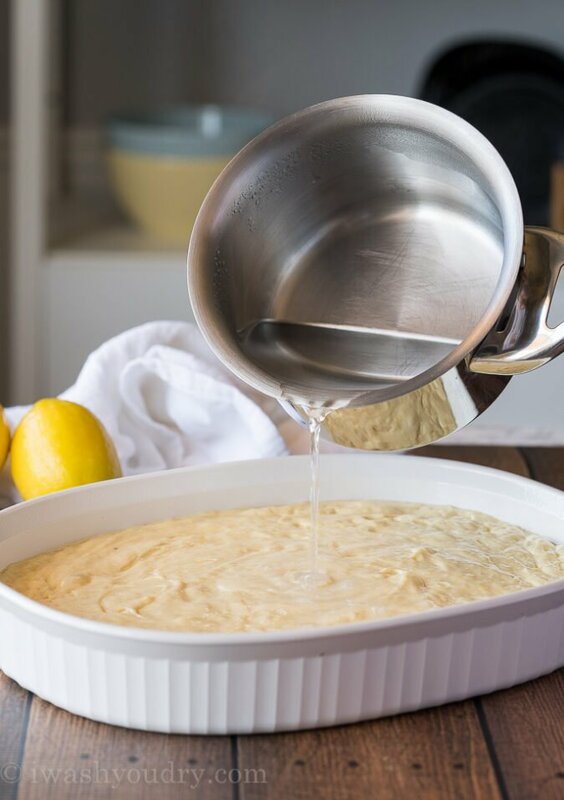 No frosting necessary for this delicious warm lemon cake. With summer right around the corner, fresh berries are plentiful. I like to dress this warm cake up with some fresh whipped cream and lots of berries. 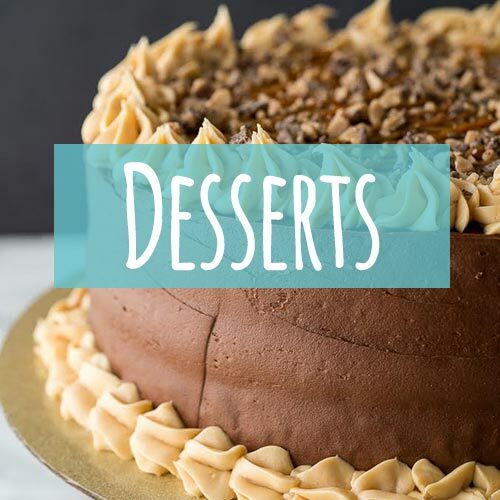 Since the cake is served warm, adding the whipped cream on top of the full cake is probably not the best idea as it will quickly melt away, but if you add a dollop to the individual servings of the cake, you’ll be better off. I love serving this light and refreshing dessert at the end of a bbq or swim party. You can check out more pudding cake options here and here! 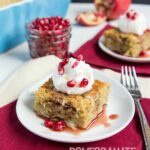 You’re going to LOVE how quick and easy this simple dessert comes together! 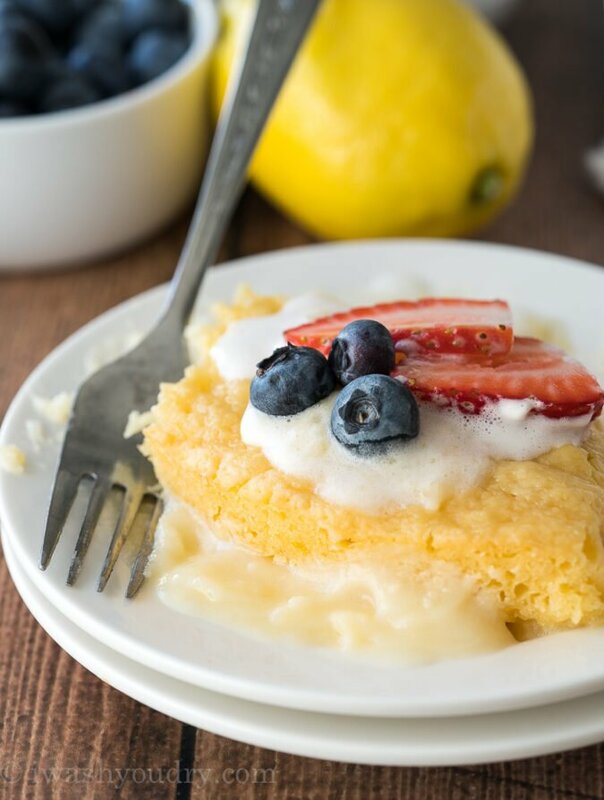 This 5 ingredient Lemon Pudding Cake is a quick mixing cake that’s sure to impress! In a medium bowl combine the cake mix, milk, and sour cream. Zest and juice the lemons to get 2 tsp zest, and 1/2 cup juice. Quickly add to batter and stir until just combined. 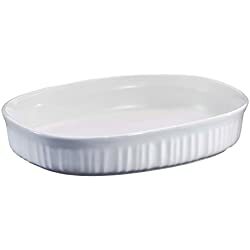 Spray baking dish with cooking spray. 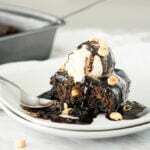 Pour batter into a 7×11 or 9×13 dish. Gently pour the boiling water over the lemon cake batter. DO NOT STIR. Bake for 35-40 minutes. Remove from oven and let sit for 5 minutes. Top with fresh berries and whip cream. Best when served warm. Enjoy!! 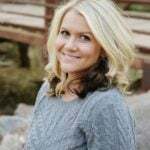 How do I get my saved recipes? 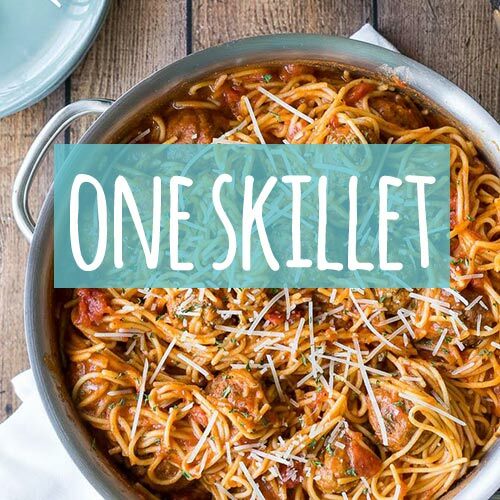 Are eggs used in the recipe? If so, how many. Getting ready to make this yumm! 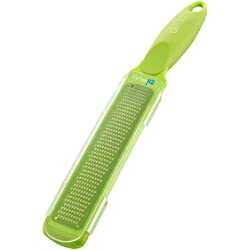 My grandmother used to make this and a cherry one just like it. Anyone know of any recipes for a cherry one? Sounds awesome! I haven’t seen any pudding cakes with cherry, but I’ll see if I can come up with something! Thanks for looking!! 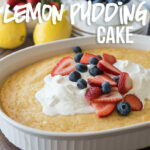 Just made the lemon pudding cake and it was delicious!! Oh my, I must have done something wrong !! 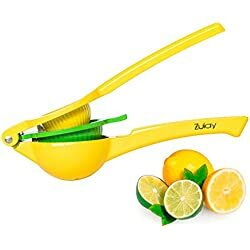 I love anything lemon but I could not eat this. Definitely not what I expected. Can you mix in fruit, like strawberries or blueberries? I haven’t tried it with berries baked in it, but I’m sure that would work! 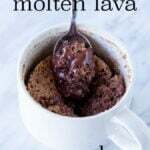 I wonder if this will work with a gluten free cake mix?? I don’t see why not? If you try it, let us know how it turns out! Can’t wait to make! Live at a high altitude, do I add the additional flour advised on cake mixes? Yes, I would add the extra flour as advised on the cake mix. 🙂 Hope you enjoy! Haha, love this post! I only have one toddler, and I can relate to needing a few minutes of peace. Love your photos, and the cake looks amazing! I will make this, too. Easy and simple is the way to go. I'd love a scoop of that for dessert right about now. A panic room sounds like sheer heaven. In fact, I might just toss all the boys in that room for the obligatory 5 minutes and keep the rest of the house for myself. HA! That looks delicious! And can I just say that I love those dishes?! Where'd you find them?